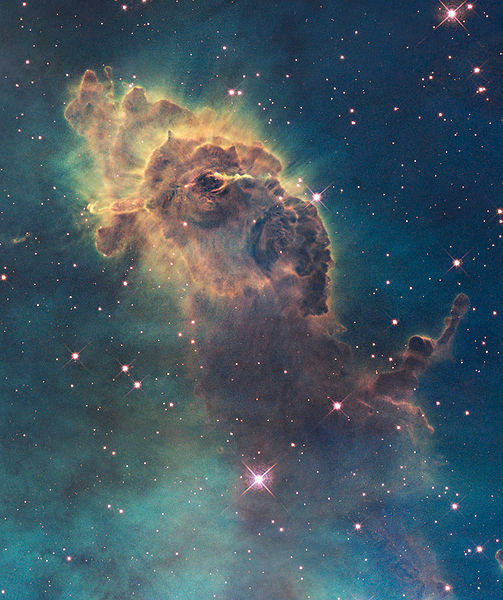 Image by NASA, ESA, and the Hubble SM4 ERO Team [Public domain], via Wikimedia Commons. Something nebulous, then, is cloudy and hazy, vague and unclear. Talk about a nebulous concept or thought or feeling or goal, a nebulous role or expectation or arrangement, a nebulous timeline or process or plan, a nebulous statement, a nebulous standard or rule, and so on. "Life coach" seems a nebulous job title to those of us unfamiliar with it, and "Help others achieve their goals" is a hopelessly nebulous job description. Conclusions drawn from educational research are often nebulous; there are just too many influencing factors in a classroom to know for sure whether an intervention should be credited fully with outcomes. Look away from the screen to explain the definition in your own words. You’ll know you understand what "nebulous" means when you can explain it without saying “fuzzy" or “indistinct." Think of a time when something unclear frustrated you, and fill in the blanks: "The problem with (this/these) nebulous _____ is that _____." Example: "The problem with these nebulous directions is that I don't know whether I should be spending twenty minutes or two weeks on the project to get a good grade." Stanley Kubrick: "However vast the darkness, we must supply our own light." 2. It's a good idea to _____ any nebulous statements in a contract before signing.